Will the NRA embrace Michael’s Law Amendment Constitutional gun carry? The National Rifle Association (NRA) has been trying for over a decade with various national reciprocity gun permit attempts. In accordance with the 10th amendment, each state has their own laws when it comes to gun rights and the 2nd amendment, with many states being strongly against national reciprocity,believing it would infringe on their state’s rights. Legal gun owners many times find crossing state lines with a firearm confusing, as a permit legal in one state may not be acknowledged by another state. Some have even been arrested doing so. The Permit map link shows which states you can carry concealed in as well as which state’s permits are honored in a particular state. The most recent bill introduced to the house has been applauded by the NRA. H.R. 38, The Concealed Carry Reciprocity Act of 2017, authored by Congressman Richard Hudson (NC-8). The question arises however, that even if the NRA is successful with a Republican Congress and President, it is unclear whether such a move that uses Federal power to force one state to accept the standards of another, would withstand judicial scrutiny. Most likely, restrictive states like New York would challenge national reciprocity on 10th Amendment “States’ Rights” grounds and such a law could be declared by SCOTUS “UnConstitutional. Thus any victory in this area could wind up being very short-lived. The original 2014 Mike’s Law bill would have created a business carry permit for Americans working in Interstate Commerce. This was rejected by the NRA. (2) gun permitting leading to gun registration leading to confiscation. So, James and the SBTC listened to NRA members, went back to the drawing board, and started all over from scratch. SBTC created Plan B the Michael’s Law Amendment to address the NRA and NRA membership’s concerns. Both the NRA and the The Small Business in Transportation Coalition (SBTC) believe there should be law allowing citizens to legally carry from state to state, relieving citizens with gun permits from the confusion of state carry laws. The difference is the way these two organizations have gone about addressing it. As part of the Michael’s Law Amendment, SBTC has recently created the Trucker Lives Matter website which offers updates and information regarding the progress of the Michael’s Law Amendment. Along with the Trucker Lives Matter website, the Social Media group on Facebook, by the same name, is quickly becoming a movement. Tucker Lives Matter on Facebook presently has over 22,000 members in just 3 weeks. 1. Michael’s Law Amendment makes the distinction between merely “possessing” a locked, unloaded firearm only for the purpose of transporting it… and actually carrying a firearm in a loaded, readily-accessible capacity for self-defense purposes. Currently, 926A neither authorizes nor prohibits the “carrying” of firearms interstate; it just speaks to “possession” for the purpose of transporting it unloaded and locked up. 2. Michael’s Law Amendment makes it a Federal Law to be able to CARRY from one state to another state. Without the need for a permit at all. 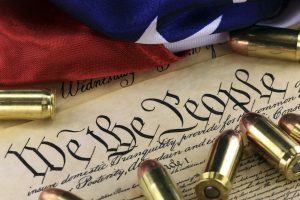 It essentially just reaffirms the Second Amendment and is a declaration of all American citizens’ right to CONSTITUTIONAL CARRY from state-to-state. 3. Michael’s Law Amendment preempts a state’s ability to regulate the carrying of firearms by an American citizen who is entering their state, leaving their state or passing through their state pursuant to Federal authority under the Commerce Clause. 4. Michael’s Law Amendment, in accordance with the 10th Amendment, respects a state’s right to regulate its own residents who choose to live, work, and travel point-to-point within that state’s boundaries. But that right stops once another state is introduced into the equation, again, as a matter of Federal authority to regulate commerce between the states. from any place in any state to any other place in a different state in accordance with the Second Amendment to the United States Constitution. The Michael’s Law Amendment… It’s NOT just for truckers. Although The Michael’s Law Amendment is not just for truckers, the truck driving community has embraces the concept of a back door for legal gun carry in all states. Q: How is Michael’s Law Amendment different from the NRA National Reciprocity bills? Once again, The SBTC bill merely tweaks an existing Federal statute (18 U.S.C. 926A) and creates a national right to carry from one state to another by asserting the “Commerce Clause” of the United States Constitution as the lawful basis for Congress to tell the states they may only regulate the carrying of firearms for their own residents that stay within their state. And it preempts them from interfering with interstate carrying of firearms in accordance with the Second Amendment. SBTS believes there is no bona fide states’ rights challenge since the Constitution clearly gives the Federal government jurisdiction over such matters pertaining to two or more different states. They have moved down only one path, the path to national reciprocity. So the question is: Will the NRA embrace Michael’s Law Amendment Constitutional gun carry? In an effort to stop the current murder rate of interstate truckers– and other workers in interstate commerce– of approximately 50 men and women per year (according to US Department of Labor, Bureau of Labor Statistics,) the Small Business in Transportation Coalition’s (“SBTC”) president, James Lamb, announced today the group has formally launched the ‘TRUCKER LIVES MATTER’ (“TLM”) movement through their new website: http://www.TruckerLivesMatter.com. According to Lamb, the website directs truckers– and other interested Americans– to join the movement on social media by becoming a member of the group’s Facebook Page. TLM is encouraging supporters to adopt the TLM logo as their social media profile picture through this Twibbon campaign. The site is also selling TRUCKER LIVES MATTER t-shirts to raise funds. A detailed FAQ page explains the group’s legislative efforts, their take on NRA’s “national reciprocity” efforts, and the various existing state laws that currently prevent truckers from carrying firearms nationwide to protect themselves. Lamb’s bill asserts Federal authority through the Constitution’s “Commerce Clause,” which allows Congress to preempt the states’ regulation of guns entering, exiting, or merely passing through their states. The website directs visitors to a petition to the National Rifle Association (“NRA”) in an effort to promote and acquire NRA support of the SBTC-written pro-gun bill called the “Michael’s Law Amendment (to 18 U.S.C. 926A),” named after the late Indiana-based over-the-road trucker Michael Boeglin who was killed and burned while sleeping in his truck in Detroit in June 2014. Lamb has been pursuing new legislation in various forms since Boeglin’s death. Boeglin’s then-pregnant widow Ashley Boeglin teamed up with Lamb in 2014 and signed on to the SBTC-led efforts to get a law passed that would enable truckers to thwart future attacks against them on the road. She has approved the use of her late husband’s name in connection with the legislation, currently under consideration by the Honorable U.S. Senator Marco Rubio (R-FL). “If there’s one thing we have learned over the past two and a half years, it’s that you don’t get a pro-gun bill introduced into Congress easily without the support of the NRA,” Lamb noted. NRA disapproved of Lamb’s first legislative draft and he says they have not commented on the new version yet, which seeks to address NRA’s past concerns. “Unlike our first attempt, this Plan B bill is not a special carve out for truckers in that it applies to all Americans and there is no gun permit or registration issue involved. We would hope the NRA is not opposed to simultaneously backing two bills, theirs and ours, as all roads lead to respecting the Second Amendment for all Americans,” Lamb said. Rubio, from Miami, Florida, who ran for president this past election cycle (2015-2016), in part, on fighting ISIS and was later re-elected to the Senate in November 2016 to a new 6 year term, is a well known supporter of Second Amendment rights. Lamb said he has pointed out to Rubio’s staff that with all the recent terrorist “truck jackings” in Europe and an ISIS-inspired terrorist attack at Fort Lauderdale airport just two weeks ago, which is in SBTC’s home city and Rubio’s own state: “It’s only a matter of time before trucks are used as weapons by terrorists here on American soil,” Lamb warned. “In talking with Rubio’s staff, we believe introduction of the bill into the U.S. Senate will happen later this month after the new Republican President has settled in, Lamb said. 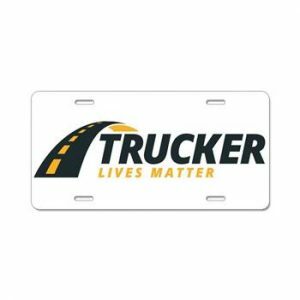 The TruckerLivesMatter.com website points truckers to employers that will allow them to carry firearms to protect themselves against the dangers of living and working on the road, including the safe truck parking shortage recently highlighted by the Wall Street Journal. Lamb appeared on Sirius XM’s Road Dog Trucking News with Mark Willis earlier this week to promote the new TLM movement and take calls for truckers. Lamb released this Facebook live footage, which represents an excerpt from the interview. 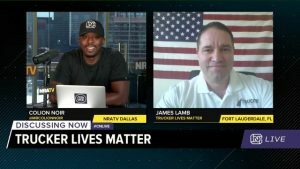 “I believe the fact that over 15,000 truckers immediately joined TLM within just a few days of our launching this movement shows that truckers believe their lives do indeed matter and it’s high time we ‘make the roads safe again’,” Lamb said.